The essence of seaside style! The medium Crab Oval Tray from our OCEAN Collection features a beautifully rendered crab, sparkling seashells, and an organic form inspired by sand dunes. The gleaming tray boasts a generous surface you'll appreciate when serving your favorite hot or cold foods. 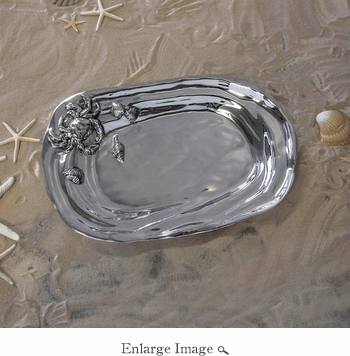 A sandcast silver tray of decorative metal, this is design as brilliant as its surface. Goes from freezer, to oven, to table; pair with any of Beatriz Ball's crab items to double the serving options.